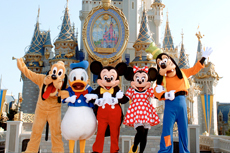 Discover the magic at Walt Disney World’s theme parks -- a fun adventure for any age! The parks are about 45 miles from Port Canaveral. Go behind the scenes of your favorite movies at Universal Studios in Florida -- the world’s premier movie and TV based theme park, about an hour drive from Port Canaveral. Sail the Atlantic and get a glimpse at some of Port Canaveral's wonderful wildlife on a pontoon river cruise. You are sure to enjoy! 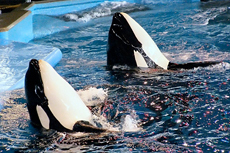 Home of the great Shamu, SeaWorld, about 45 miles from Port Canaveral, offers a multitude of marine attractions and shows and is especially fun for family travelers. 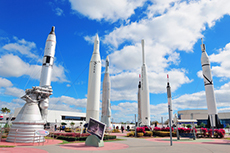 Port Canaveral is home to the Kennedy Space Center and The Astronaut Hall of Fame. The city also provides access to central Florida's Everglades and the nearby Cocoa Beach. 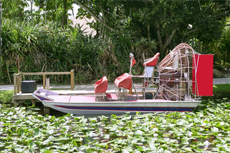 On this fascinating adventure, you will experience the unique ecosystems and wildlife of an endangered estuary in a pontoon boat. Certified eco-guides lead this expedition and explore the home of the bottlenose dolphin that will feed and swim around the boat. Orlando Theme Parks! If your ship is in port for at least 8 to 10 hours (or if you're overnighting), one of the major appeals of Port Canaveral's location is its proximity to Orlando. See below for must-visit attractions in Orlando. Near Port Canaveral, you'll find Merritt Island and the Canaveral National Seashore and Merritt Island National Wildlife Refuge. The NASA-owned refuge is home to more endangered species -- such as the Western Indian manatee, Southern bald eagle and Atlantic loggerhead turtle -- than any other refuge in the United States. Visitors can take advantage of a seven-mile auto tour route along Black Point Drive, four hiking trails ranging from 1/4 mile to 5 miles in length, a manatee observation deck and boating and canoeing. Also on Merritt Island is the Kennedy Space Center (open daily from 9 a.m. to 5:30 p.m.). There are more than enough attractions to fill a full day, but the highlights can be done in half a day if time is short. 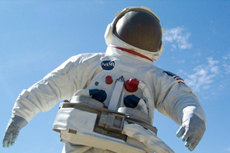 The maximum access pass allows admission for two consecutive days and also includes admission to the U.S. Astronaut Hall of Fame; its realistic astronaut training simulators allow guests to feel the pressure of four times the force of gravity, take a virtual moonwalk and ride a rover across Mars. Astronaut Encounter, the center's meet-and-greet program, is held several times daily. The program consists of Q&A sessions, mission briefings and personal stories of space travel, as told by those who have flown in space. For a low-key beach day, Cocoa Beach, about a 15-minute drive south from Port Canaveral, features a blend of family-friendly activities -- and lots of honky-tonk bars. The center of the action is the Cocoa Beach Pier (401 Meade Avenue, Cocoa Beach), established in 1962. It's a Space Coast historic landmark, featuring four restaurants, four tropical bars, some small boutiques, fishing (rods available for rent) and fantastic views. There's live entertainment daily. It's a favorite spot for watching shuttle launches. About a half-mile hike south is the Ron Jon Surf Shop (Cocoa Beach at the intersection of Highway 520 and A1A); it's a fantastic destination for more than just surf gear -- check out bathing suits, casual wear, sunglasses, sandals, flip-flops and even home accessories. Open 24 hours, the store is massive -- spread out over a half-million feet on two floors. Space Coast Nature Tours (451 Marina Road, Dock A, Slip 23, Titusville; 321-267-4551) 90-minute tours operate at 10:30 a.m. and 1:30 p.m. daily. 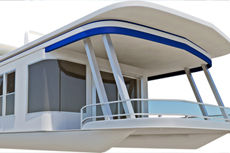 Try a cruise on the electric-powered, 49-seat Skimmer to assure a quiet cruise on the Indian River Lagoon, where manatees and dolphins play. 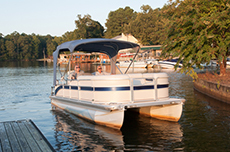 Island Boat Lines (321-454-7414) offers two-hour, daily eco-tours (10 a.m. and 2 p.m.) on pontoon boats. Also featured are Sunday trips (3 p.m. to 6 p.m.) through the Locks of Port Canaveral, offering up-close views of cruise and naval ships, a submarine base, Space Lab and U.S. Coast Guard Station. The American Police Hall of Fame & Museum (6350 Horizon Drive, Titusville; 321-264-0911) is just west of the gates to the Kennedy Space Center and across from the Astronaut Hall of Fame. Daily, from 10 a.m. to 6 p.m., you can sit in an electric chair or check out crime scenes and exhibits of infamous crimes throughout history. Children can take a peek at the Robocop and police uniform dress-up area, visit a badge-making station and sit on a real police motorcycle. Established in the 1800's in the center of the famed Indian River citrus region, historic Cocoa Village offers a taste of old Florida. Many of the buildings, including the 1924 Cocoa Village Playhouse, are listed in the National Register of Historic Places; the 1885 S. F. Travis Hardware Store is actually the oldest business on the Atlantic Coast -- from Jacksonville to Key West -- and is still operated by the original family. A variety of boutiques and shops lines the streets of the five-block district. Note: Cocoa Village is not located in Cocoa Beach. First-timers to Orlando, who have the opportunity to visit only one park, should go to Magic Kingdom at Walt Disney World. The park that started it all back in 1971, Magic Kingdom is the flagship of the 30,000-acre Walt Disney World property. It is divided into seven sections with attractions for all ages: Main Street U.S.A., Adventureland, Frontierland, Liberty Square, Mickey's Toontown Fair, Fantasyland and Tomorrowland. For more information on Magic Kingdom, visit FamilyVacationCritic.com/magic-kingdom-family-vacation/dfv/. If you've got more time on your hands there are lots more parks to check out including Epcot, which offers visitors a trip around the world and a glimpse of the future. Disney's Hollywood Studios, a working studio and theme park rolled into one, is the place for movie buffs. At Disney's Animal Kingdom visitors can go on an "African safari" to see real lions, giraffes, zebras, elephants and other exotic animals roaming free in a savannah. Universal Orlando is the place where films and television shows such as "Spider-Man," "Shrek," "The Incredible Hulk" and "The Simpsons" come to life in rides and attractions. 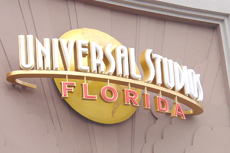 Universal Orlando has two parks, Universal Studios and Islands of Adventure. Even though Orlando is not on the coast, there is water, water, everywhere -- in a variety of aquatic parks. Visitors can swim with dolphins or stingrays, snorkel to see tropical fish and feed exotic birds in an aviary at Discovery Cove. Other water parks with slides, lazy rivers, wave pools, kid's water fun areas and rides include Blizzard Beach (themed like a ski resort, where the snow has melted and left pools, and including such attractions as a "ski-lift") and Typhoon Lagoon (where the theme is what has remained after a storm has blown over), both on Disney property; and Universal Orlando's Wet 'N Wild, where The Storm thrill ride invites the daring to drop from a chute into a spinning bowl and where other attractions include multipassenger tube rides. The Charles Hosmer Morse Museum of American Art in Winter Park is a short drive from downtown Orlando. It features a large collection of Louis Comfort Tiffany glass. The collection includes stained-glass windows, the famous Tiffany lamps, vases, jewelry and other objects. A highlight is the Tiffany Chapel, in Byzantine style, which includes stained-glass windows, a baptismal font, altar, tabernacle, and a glass mosaic behind the altar. Gatorland is a 110-acre park where you can see alligators and crocodiles galore, plus birds and other animals. Shows include alligator-wrestling and reptilian spectacles. You can see the park's collection of giant white alligators -- yes, white! -- and pet a baby alligator. (Relax, they tape its mouth.) If it's hot, there is a Splash Water Park to cool off. At the Richard Petty Driving Experience at the Walt Disney World Speedway, visitors don flame-retardant suits and helmets and board a racecar with a 600-horsepower engine to spin around the track at white-knuckle speeds. There are several options -- including the Ride-Along, which involves riding shotgun in a two-seat NASCAR-style stock car that's driven by a professional racecar driver for a three-lap Qualifying Run at high speeds. Another option, the Rookie Experience, puts visitors in the driver's seat for eight laps around the track. Florida EcoSafaris at Forever Florida is a 4,700-acre ranch, with zip-lining over the canopy of cypresses and other trees of a natural forest at heights of up to 55 feet (about the equivalent of a five-story building). History buffs may wish to check out the Orange County Regional History Center in downtown Orlando. The museum is housed in a historic courthouse, dating from 1927, and has three floors of permanent exhibits chronicling the region's history. It also hosts visiting exhibitions. Adventure seekers take note: Hot-air balloon rides usually begin at dawn, and flights take visitors over the Magic Kingdom or other areas, depending on the prevailing winds -- ours took us over fragrant orange groves and swamps, and our pilot took our basket down so low to the swamp we actually heard the gators growl! Among the companies that offer hot-air ballooning are Bob's Balloon Flights and Orlando Balloon Rides. With 72 miles of Atlantic shore, the Port Canaveral area boasts some of the state's most spectacular beaches. 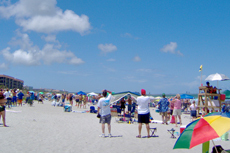 From Port Canaveral, south to Sebastian Inlet State Park, are more than 35 miles of public beaches. Just about any eastward turn off of State Road A1A will provide access to the beach, but beach parks offer restrooms, showers and picnic pavilions. Jetty Park, at the east end of Port Canaveral, has year-round lifeguards, beach wheelchairs, a snack bar, a bait-and-tackle shop and a 1,000-foot-long fishing pier. Several side streets in Cocoa Beach have metered parking and dune crossovers to the beach. Best for Seclusion: Canaveral National Seashore stretches for 23 miles and is completely undeveloped. There are even great views of the space shuttle launch pads. Best for Families: At Lori Wilson Park (1500 N. Atlantic Avenue, Cocoa Beach; 321-455-1380), there are concessions, hiking and nature trails, a wide expanse of beach, fishing and swimming. 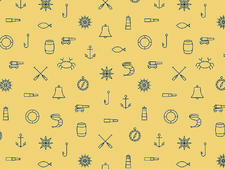 Best for an Active Day: At Sebastian Inlet State Park (9700 S. S.R. A1A, Melbourne Beach; 321-984-4852), there's a beach, bike trails, boat tours, canoeing, fishing, kayak rentals, scuba-diving and snorkeling.